The shortlist has today been revealed for the Mumbrella Awards 2016. 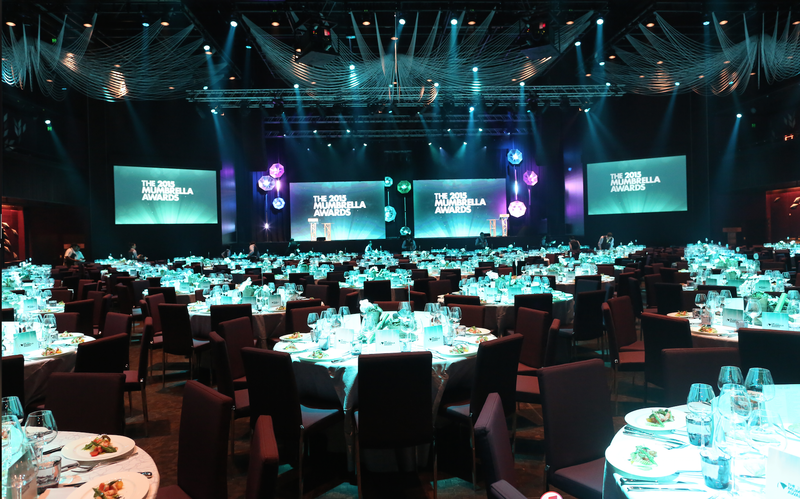 The Mumbrella Awards is the only industry awards where every category goes through a live judging process in front of a senior industry jury, with dozens of teams from the media and marketing industry set to go before the judges on May 26 at the Hilton Hotel in Sydney. During that week a roving jury will visit Auckland, Melbourne and Sydney to run the rule over the finalists in the Creative Agency of the Year category where Whybin\TBWA’s Sydney and Melbourne offices will face off against each other. They are up against Colenso BBDO, Leo Burnett Melbourne and last year’s winners The Monkeys, for the prize. Another jury will visit the finalists in the Media Agency of the Year category with newcomers Atomic 212 and Havas Media up against reigning champions Match Media, plus DentsuAegis agency Carat and Omnicom’s PHD. Overall entries for the awards were up by 57% on last year, with 148 of the 572 entries making it through to the shortlists. Big brands fought through a record number of entries for the Marketing Team of the Year category, with last year’s Highly Commended Meat & Livestock Australia up against supermarket Aldi, banking giant ANZ and betting brand UBET. A diverse array of publications made the shortlist for Media Brand of the Year, with last year’s winner Pedestrian.TV the only survivor from that shortlist. Youth brand Vice and baby boomer-targeting Starts at 60 face off against broadcaster SBS and sporting brand Cricket Australia Digital. Emerging Agency of the Year could get personal as two groups that co-habit office space, Poem and The Special Group, go head-to-head against APN News & Media backed start-up Emotive, whose founder Simon Joyce is also amongst the five nominees for Industry Leader of the Year. He will face competition from Host and One Green Bean founder Anthony Freedman, industry charity Unltd founder Kerry McCabe, founder of The Remarkables Group Lorraine Murphy, and DentsuAegis ANZ CEO Simon Ryan. TV Ad of the Year sees the public asked to vote for their favourites from the MLA’s Australia Day campaign Operation Boomerang, Western Sydney University’s Deng Thiak Adut Unlimited, Aldi’s Like Brands Only Cheaper Part II, Optus ad starring Ricky Gervais in the bath and ANZ’s Equal Futures commercial. Host have a two in five chance in the new Best Use of Real-Time Marketing category up against Starcom, Colenso BBDO and Atomic 212. In some categories, jurors were asked to cull their shortlist from more than 40 entries. As Mumbrella has previously announced, the jury this year consists of more than 80 senior industry players, mainly from a marketing background. It is also believed to mark the first time that a major industry awards has had a gender-balanced jury. And once again big-name party DJ Hot Dub Time Machine will be wowing the crowds at what is now widely acknowledged as the best industry awards afterparty of the year. Tickets – which sold out last year – are now on sale. Data Creative and Hawthorn Football Club – What are your lifetime Hawks’ stats? PHD Australia, The Hallway and Shine Australia, Network Ten for Google – OK Google, what’s a Yuzu? SapientNitro and Carat for Mondelez – Choc + What?